It’s hard to dispute a recommendation like that. Especially when she loans me one of her three copies. Every night for months Conor O’Malley has woken up from a horrifying nightmare, one he refuses to talk about to anyone. On one such night, he wakes up to find a monster outside his bedroom window. And not the monster from his nightmare. This monster looks more like the yew tree from the hill in his backyard. Despite the monster’s truly terrifying appearance, Conor finds that he’s not all that scary, partially because this monster’s most significant activity is storytelling. Each time he visits Conor, the monster tells him a story. This seems like a complete waste of time to Conor, who has bigger things to worry about, most considerably his mother’s health. She has stopped responding to treatments and seems to be hanging on by the simple belief that she’ll get better. But Conor’s not so sure. 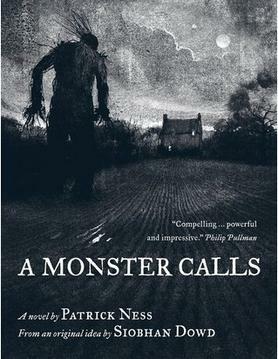 Combined with breathtaking and haunting illustrations, Patrick Ness and Jim Kay take us into Conor’s nightmare, one drenched with honesty and desperation, and guided by the somehow gentle hand of a monster.